When you're presenting to a midsized group of up to 30 or so, the information on the screen needs to be clear for people in both the front and back rows. 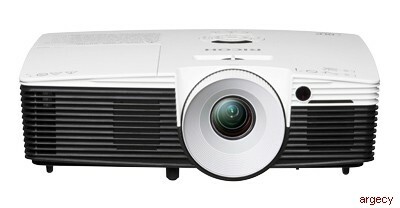 Switch on Ricoh's PJ X5460 projector, and you'll see industry-leading brightness - displayed in up to 301 diagonal inches. Setting up and testing projectors right before your presentation takes time you may not have. Instead, check out the PJ X5460 anytime by connecting it to your network. You'll discover any issues and confirm the time remaining on the lamp. If the lamp wasn't turned off after a meeting, you can switch it off remotely. Surprise! The wall you need to use for your presentation is green. Good thing the PJ X5460 has automatic wall color correction. And, you won't have to worry about image distortion because the automatic keystone correction takes care of that. You can put off adding a budget line item for lamps when you know you have 3,000 hours to work with - or 4,000 hours in eco-mode, because the projector automatically adjusts lamp brightness to conserve energy. Sometimes 3D is the perfect way to get your message across. The projector's ready to bring dinosaurs, engineering/design models and other images to life. Just purchase the optional 3D glasses. 1 Lamps are consumable products and therefore are not covered by the projector's warranty. 2 In default condition, VGA Out is disable in Standby mode. VGA Out is enabled when projector is turned on. The Ricoh PJ X5460/PJ WX5460/PJ HD5450 is under warranty against defects for a period of three years from the date of purchase. Consumables are under warranty for a period of 90 days from the date of purchase or until depleted, whichever comes first. Please refer to warranty documents shipped with the product for more details.